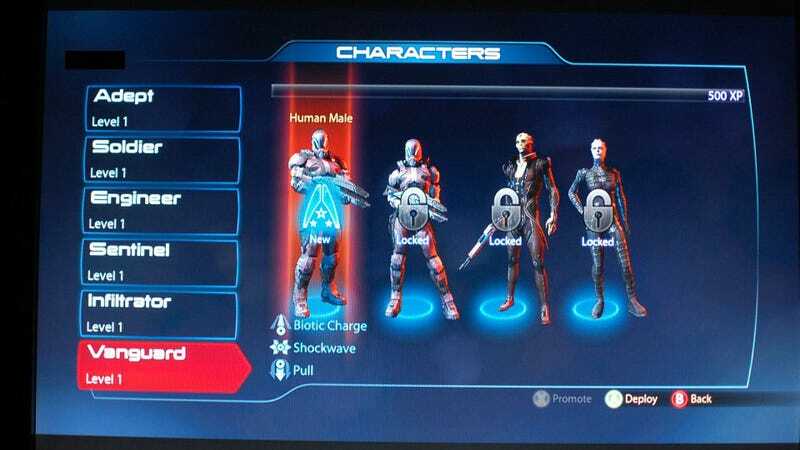 Earlier today, a private, closed beta for Mass Effect 3 accidentally turned up on Xbox Live. The 1.8GB download gave users access to singleplayer and multiplayer sections of the game well ahead of the beta's 2012 public release. It seems to have been taken down by now, but while it was up lucky users were able to grab screenshots and video, which show the same singleplayer portion of the game shown to the press at GamesCom, along with some multiplayer stuff like character selection. They also show that this was very much a beta, with missing textures, effects, etc. Of interest are a screen showing Origin support, multiplayer character creation and level selection, along with character stats and other pieces of user interface 100x more useful than any hand-prepared action screenshot. Some of the shots are courtesy of the link below, others were kindly sent in by readers. Thanks!